This is it. We all have one week left to go before shooting begins, but we have made great strides on all fronts in preparation for filming. Last week we held our first film test with our elements at the stage they were in at the time for a presentation. This was made to demonstrate what we hope to achieve in terms of shot composition and how each piece would fit together, resulting in this wonderfully goofy short. Since then we have all made great strides. 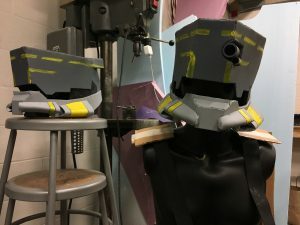 For myself in costume and props land my focus has mostly shifted towards completing the helmets, they’ve moved along some since the last update as you can see in the video, but since then, once I finalized the general structure of the pieces I used a hot knife to etch into the EVA foam to create small details. 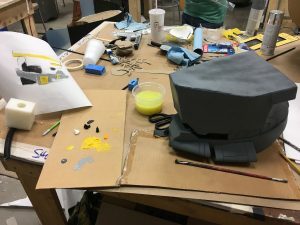 After this a few coats of spray PlastiDip were applied to seal the porous surface of the foam, making it much easier to work with when painting. 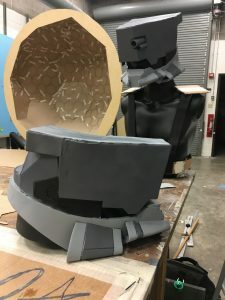 Both helmets were primed and then moved into the hand painting stage using acrylics. 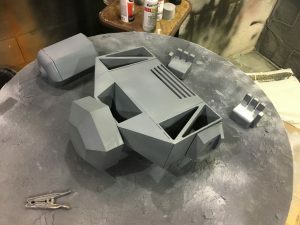 Now the base coat of paint is just about finished (the yellow being slightly uncooperative due to being against a dark background) I am about to start the detail/effects painting process and they should be almost complete. 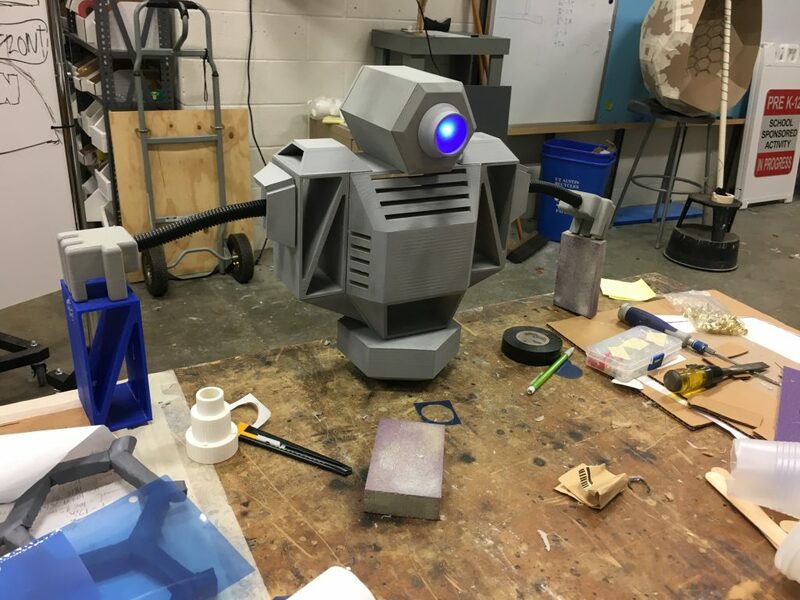 In robot news similar steps have been taken, he was assembled and coated with primer for our demo and was given a prototype lighting fixture with which to assert his dominance. 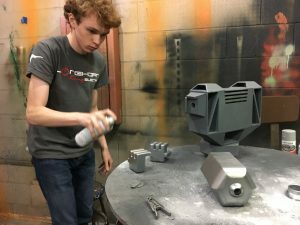 But since then Dylan and the rest of the group have pushed forward, coating our robot in many coats of filler primer to fill in all of the ridges left by the 3D printing process, after which we sanded, before coating him again with regular primer and then wet sanding each piece. 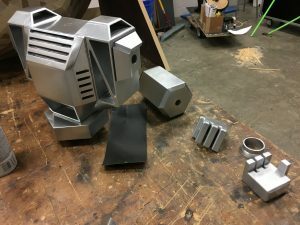 After this was finished we moved ahead with applying the final chrome paint to the robot to test its appearance on the pieces. 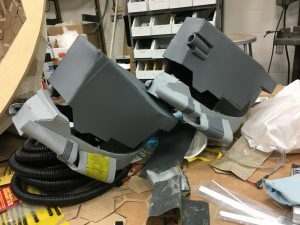 While these continue to dry Dylan has moved ahead with experimenting with upgrading our robots arms to be both more proportional to the rest of the body while also offering more structure so they don’t bend in so many point as they do in the demo. Last but certainly not least AJ has made great strides on our set in the past week. Dylan and I struggled to work with it for the demo video previously due to its flexible nature, AJ took this feedback and constructed a custom support rig for the dome and some stands so shooting with it on the 12th should go very smoothly. 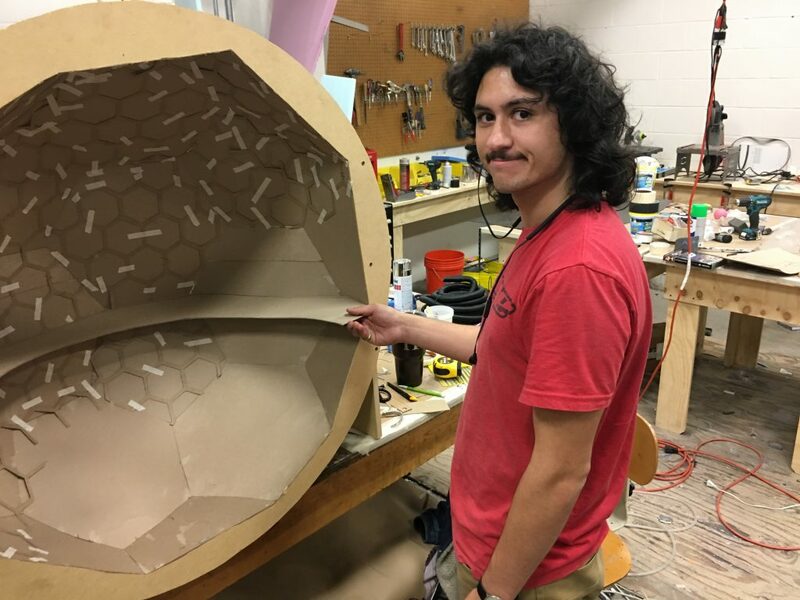 He has also been hard at work laying the honeycomb pattern shown in the demo across all of the dome instead of suspending it like it was previously, which has turned out to be a surprisingly daunting task that I only fully appreciated after helping on it myself. That said it is coming very close to completion.